So excited for this! The time has come once again for Toledo’s best art event of the year. Artomatic 419! is free, open to the public, and happening over the course of Three (3) Saturdays starting tomorrow–April 2nd, 9th, and 16th. Come on out! Check the website for schedules and more information! Artomatic 419! 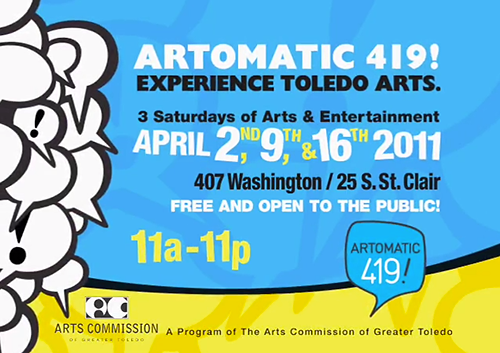 | Downtown, in the Warehouse District | 11 a.m. – 11 p.m.
First day of Artomatic 419!